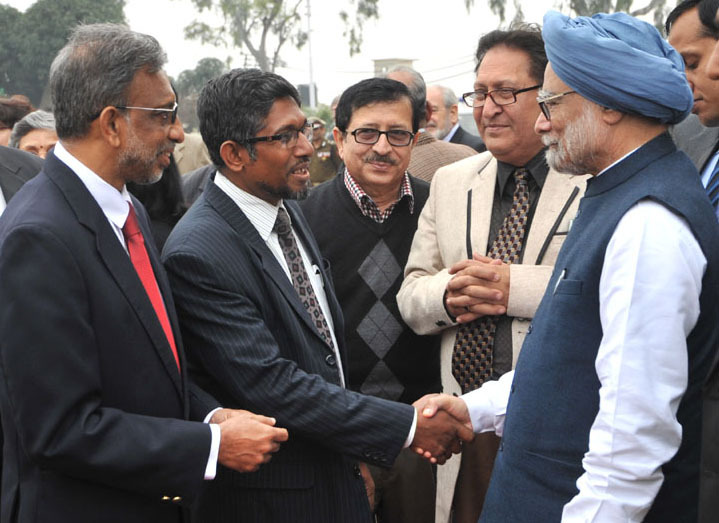 The Prime Minister, Dr. Manmohan Singh meeting the Scientist of the Indian Science Congress, in Jammu.Prof.R.C.Sobti is also seen in the photo. Prime Minister Manmohan Singh scheduled to inaugurate the 101st annual session of the Indian Science Congress which will begin in Jammu from Monday. The five-day festival which would be held at the Jammu University will focus on the theme “Innovations in Science and Technology for Inclusive Development”. International experts along with national luminaries from different streams of science and technology and many science academics are expected to participate in this congress. As many as 12,000-15,000 delegates, including Nobel laureates, senior scientists, teachers, young scholars and students are expected to participate and present their research findings. A road map for investing science into the development process of India is the main topic for discussion. Earlier, Jammu and Kashmir Chief Minister Omar Abdullah met Prime Minister Manmohan Singh in Jammu and raised the issue of Army’s controversial decision to close the Pathribal fake encounter case, saying punishment should be meted to those responsible for killing of innocent people. Omar also emphasized the need for giving justice to the families of the victims, an official spokesman said. Five civilians were killed in a fake encounter on 26th March 2000 at Pathribal in South Kashmir with the victims being branded by Army as foreign militants. The case was handed over to the CBI for investigation in January, 2003. The CBI in its chargesheet concluded that officers and jawans of the Seven Rashtriya Rifles — Brig Ajay Saxena, Lt Col Brahendra Pratap Singh, Maj Saurabh Sharma, Maj Amit Saxena and Subedar Idrees Khan had staged a fake encounter and killed five innocent civilians whom they said were terrorists involved in the massacre of 35 Sikhs at Chittisinghpora in south Kashmir on 20th March 2000. Omar wished good health and well-being to Singh which he reciprocated warmly. The Prime Minister also wished peace and progress in the State and well-being of its people.